The Kimberly Green Latin American and Caribbean Center (LACC) at Florida International University was selected from among the nation’s leading Latin American Studies programs as a recipient of the prestigious Tinker Field Research Grant. 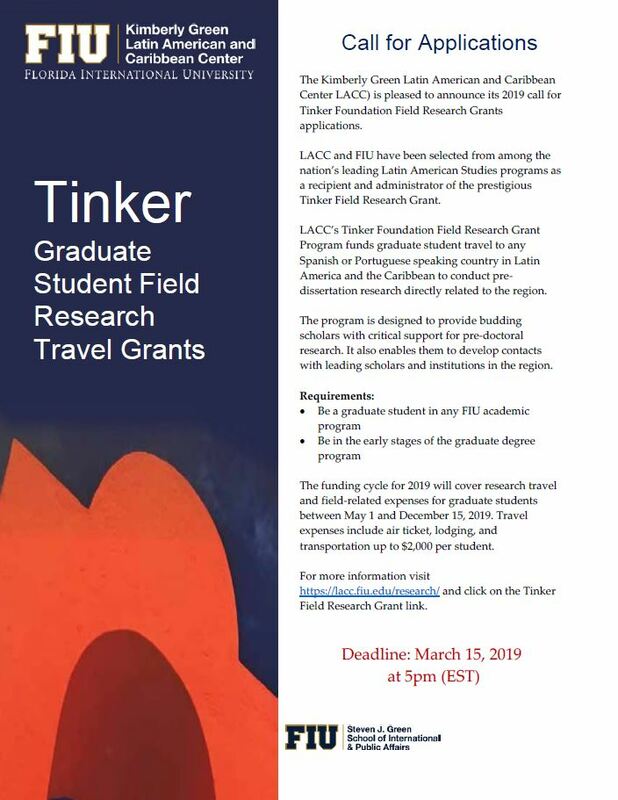 The Tinker Foundation Field Research Grants Program funds graduate student travel to any Spanish or Portuguese-speaking country in Latin America and the Caribbean to conduct pre-dissertation research directly related to the region. It is designed to provide budding scholars with critical support for pre-doctoral research and also enables them to develop contacts with leading scholars and institutions in their respective fields of study. With available funding levels of $10,000 or $15,000 per year, LACC is particularly proud of being awarded one of the Tinker Foundation's $15,000/year grants which carries with it the possibility of two additional one-year renewals. LACC's 1:1 match brings total support for Tinker grant graduate student awardees to $90,000 over 3 years. Contact LACC's Director of Research at (305)348-2894 for more information about our Tinker Field Research Grant program.